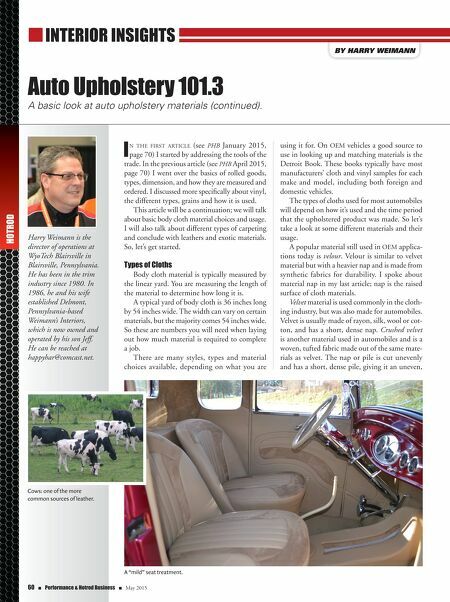 Auto Upholstery 101.3 A basic look at auto upholstery materials (continued). n INTERIOR INSIGHTS By Harry Weimann I n the first article (see PHB January 2015, page 70) I started by addressing the tools of the trade. In the previous article (see PHB April 2015, page 70) I went over the basics of rolled goods, types, dimension, and how they are measured and ordered. I discussed more specifically about vinyl, the different types, grains and how it is used. This article will be a continuation; we will talk about basic body cloth material choices and usage. I will also talk about different types of carpeting and conclude with leathers and exotic materials. So, let's get started. Types of Cloths Body cloth material is typically measured by the linear yard. You are measuring the length of the material to determine how long it is. A typical yard of body cloth is 36 inches long by 54 inches wide. The width can vary on certain materials, but the majority comes 54 inches wide. So these are numbers you will need when laying out how much material is required to complete a job. There are many styles, types and material choices available, depending on what you are using it for. On OEM vehicles a good source to use in looking up and matching materials is the Detroit Book. These books typically have most manufacturers' cloth and vinyl samples for each make and model, including both foreign and domestic vehicles. The types of cloths used for most automobiles will depend on how it's used and the time period that the upholstered product was made. So let's take a look at some different materials and their usage. A popular material still used in OEM applica- tions today is velour. Velour is similar to velvet material but with a heavier nap and is made from synthetic fabrics for durability. I spoke about material nap in my last article; nap is the raised surface of cloth materials. Velvet material is used commonly in the cloth- ing industry, but was also made for automobiles. Velvet is usually made of rayon, silk, wool or cot- ton, and has a short, dense nap. Crushed velvet is another material used in automobiles and is a woven, tufted fabric made out of the same mate- rials as velvet. The nap or pile is cut unevenly and has a short, dense pile, giving it an uneven, Harry Weimann is the director of operations at WyoTech Blairsville in Blairsville, Pennsylvania. He has been in the trim industry since 1980. In 1986, he and his wife established Delmont, Pennsylvania-based Weimann's Interiors, which is now owned and operated by his son Jeff. He can be reached at happyhar@comcast.net. 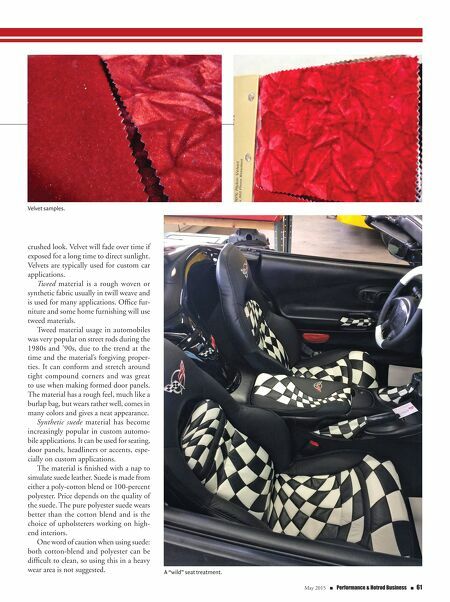 HOTROD 60 n Performance & Hotrod Business n May 2015 Cows: one of the more common sources of leather. A "mild" seat treatment.